Please don’t live in denial! It’s a waste of time. You are not doing your child any favor. Accept the fact and move on towards the process of helping your child to have a better life. Let me tell you about what happens if you do live in denial. I was assigned to a child, little Johnny, who was diagnosed with severe autism. My job was to work with Johnny on a one-on-one basis in a classroom. The level of this classroom was way above his. Given the fact that his condition wouldn’t let him join the class and the teacher to learn in a formal way, he missed out on all learning opportunities from his instructors, and was not able to participate in the simplest group activities. The reason why he was in this classroom in the first place was his parents’ choice. They believed that exposing Johnny to a higher level classroom environment would fix his problems. At the end of the year, they were disappointed because their assumption turned out to be completely wrong. Wrong placement ended up isolating Johnny from a healthy learning environment and his classmates. Had his parents fully accepted his condition and the professionals’ suggestions (psychologists, program specialists, teachers, educators, speech pathologists, etc.) he would have been in an environment tailored to his condition with other children like him, which would have allowed him to communicate and interact more effectively and frequently. In the end, the parents’ denial defeated the purpose of their intention: putting Johnny in a class of a higher level separated him from the class activities and classmates. So what is the lesson here? When you get a diagnostic from professionals regarding your child’s condition, don’t take it personally. This is not an insult meant to hurt you. At the end of the day, everyone on the spectrum is like any one of us, but with a different brain wiring. Be factual and take it for what it is. Listen to the professionals’ advice. They don’t judge you or your child. They are trying to find the best solution for you as a family. We understand the parents’ feeling when they are first hit with the diagnosis and we know that it takes time to grieve that their child is not “normal” and we know that it takes a while to accept. But it shouldn’t override your ability to act upon the problem promptly and positively with a lot of hope. Be patient, it’s a long journey, take it one day at a time. And don’t forget: don’t be in denial. To help parents of a newly discovered autistic child to adjust quickly to the new situation and demands, organised formal counselling may be necessary to coop with the initial shock of discovery? Formal and even unformal counselling would be of a huge support to the family. If the parents accept the idea of counselling in the first place that means they are already moving in the right direction and started accepting the fact. Family, friends and neighors can play a primordial role in bettering the parents life. We understand and respect the sorrow and grief that parents go through when the news first hits, but the faster they open up and come out of their shell the faster they will adjust to their new life. Again it is never enough to emphasize the importance of communication. They need to talk to people and support groups to learn from their experiences. I seriously appreciate all of the grueling effort that you’ve devoted to keeping this place going for all of us. I really hope this sticks around for a really long time. My passion is guiding me. I’ll keep writing. I appreciate your comment so very much. Your friend in denial needs your help. Tell her that if she really wants to help her child she needs to change her strategy. First, she needs to have a reward system and concequence system. She needs to find out about her child’s interests (what he likes) and have him earn it, that means her child needs to work for it. Nothing comes for free. Second, if she is not cooperating with her child’s school guidelines, her child may end up in the lowest functioning possible placement. The behaviors should be addressed the soonest possible. If she doesn’t take it seriously, the behaviors will keep going from bad to worse. She’ll be the one to suffer the most. Consistency is very important to change behaviors. I know it is very consuming and tiring to work on every behavior and promptly, but the price otherwise will be very high. It might be a good idea it she talked to the school staff (teacher, psychologist, speech pathologist) as well as the parents of her child’s peers or other parents of autistic children. He doctor too, is a great resource. There is an article in my blog that suggest some books if she is willing to read. “13 highly recommended books”. She needs to act now and get involved in her child’s problem. We all know how painful it is, when parents learn about their child’s disability, but they can not dwell on their sadness. Even grief has a limit. Your comment is highly appreciated! Thanks. Thanks for this post. As a Kindergarten teacher in a General Ed classroom, I have experienced situations like this many times. Your viewpoint is dead-on and your heartfelt honesty was evident in every word. I wish you a wondful school year and hope my blog helps you in your classroom, with your students, and their parents too. 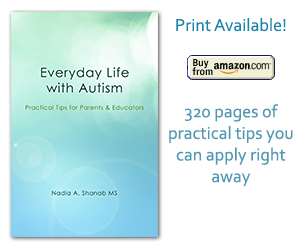 Even though the main focus of this blog is the tips I provide for children on the autism spectrum and their families, but most of the tips can be equally useful for General Ed too. Thank you for reading! I appreciate your kindness so very much!